©Photographed by Stephanie M. Smith. Visit her Web site www.healthnut.zenfolio.com. My fabulous intern, Stephanie Smith, and I came up with this “tasteover” together. We wanted to highlight fresh colorful berries in a comforting dessert. This raspberry-blackberry cobbler is the result. The photo speaks for the deliciousness, which is all thanks to Stephanie. Watch out world … a budding professional photographer is in the making. We hope you enjoy our cobbler. Let us know what you think! Preheat the oven to 350°F. Coat a deep-dish (about 10 1/4-inch) stoneware pie baking dish or a 9- x 13-inch stoneware baking dish with cooking spray. Whisk together 1 cup of the sugar, the flour, oats, baking powder, milk, extracts, and salt until well combined. Whisk in the melted butter. Pour the batter into the prepared baking dish. 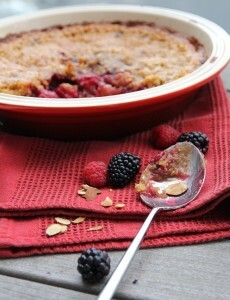 Sprinkle evenly with 1 1/4 cups of the blackberries, 1 1/4 cups of the raspberries, and the remaining 1 tablespoon sugar. Bake until golden brown, about 1 hour. Remove from the oven and let stand for at least 5 minutes. 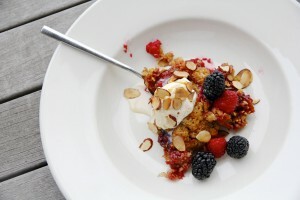 Portion into 6 bowls using a large spoon, top with the frozen yogurt, the remaining 1/2 cup blackberries and 1/2 cup raspberries, and the almonds, and serve. Preheat the oven to 350°F. Grease a 3-quart baking dish with 2 teaspoons of the butter. Whisk together 1 cup of the sugar, the flour, milk, and salt until well combined. Whisk in the melted butter. Pour the batter into the prepared baking dish. Sprinkle evenly with the blackberries and 1/4 cup of the sugar. Bake until a light golden brown appearance, about 50 minutes. Sprinkle with the remaining 2 tablespoons sugar and continue to bake to a bubbly, golden brown appearance, about 10 minutes more. Portion into 4 dessert bowls, top with whipped cream, and serve. Looks delicious Jackie! Thanks for sharing.